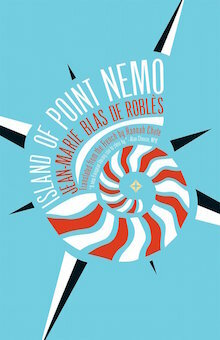 The Island of Point Nemo is a novel tour by plane, train, automobile, blimp, horse, and submarine through a world that I can only hope is what Jean-Marie Blas de Roblès’s psyche looks like, giant squids and all. What begins as a seemingly simple case of jewel-thievery affecting a high-class widow takes a twist for the dystopian and absurd as the heroes chase severed limbs and diamonds the size of your fist across the globe. Every clue toward the recovery of the jewels is another knot in the storyline, and every character they meet is a new disaster, a new twist in the road. On the advice of hookers, sword-swallowers, and train car strangers, always dandily dressed to the nines, Martial Canterel, our hero, races toward Point Nemo (the place in the ocean geographically farthest from land) in search of the stolen diamond while Point Nemo (the book) barrels deeper into a world that, every time you think it’s gotten too fantastical, you’re reminded how real it is. The state of reality in the Point Nemo world is certainly casually crumbling, from mobs of mercenaries hijacking trains to islands of circus-troupe rejects. But what seem like some of Jean-Marie Blas de Roblès’s more absurd creations aren’t actually creations: grotesque models of the human body displayed as art (real), guerrilla groups out to save the world one good deed at a time (real), and bicycle-powered e-readers (Christmas 2017?). The good news is that all of this is just a story we’re being told! Or, rather, it’s the story being read to factory workers to quell their boredom as they build e-readers the whole monotonous day long. This novel encasing the novel isn’t a bit fantastical: Jean-Marie Blas de Roblès shows us the lecherous boss peeping into the locker rooms, the sexless marriage (complete with creative, cringe-worthy, porny attempts at reawakening desire), the long hours working for nothing, and the beloved dying wife inspiring the author. In the end, of course, the world is still in chaos around all of them. Jean-Marie Blas de Roblès’s novel ends up not so unlike the riveting story-within-the-novel told to the enraptured factory workers to keep them on task: an entertaining yet haunting distraction from a world quietly crumbling around the reader.